I am the biggest advocate for being good to your skin. I worship skin care companies that help me keep my skin soft, clean and glowy. In my younger days I will admit I was not the kindest to my skin, long days spent in the sun definitely left some damage. Did you know that 90% of signs of aging are caused by sun – damage?! Knowing that I can say I now I make a conscious effort to incorporate sun screen into my every-day routine. 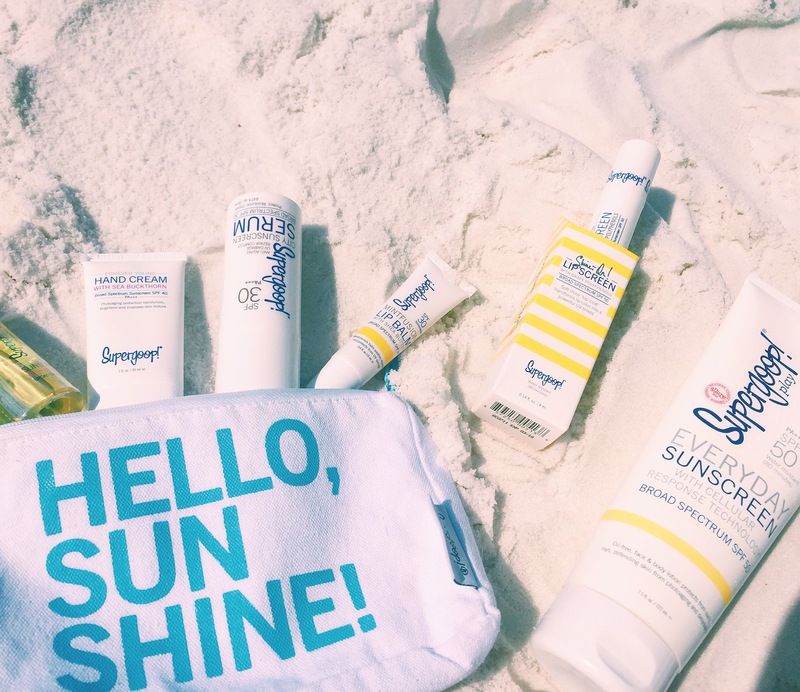 This summer I partnered with sunscreen experts – SuperGoop to help protect my skin against the suns rays. With a slogan like “It’s not skin-care unless its sun-care” who wouldn’t trust SuperGoop’s sun screen solutions?! I mean come on! After using their amaze products for the past few weeks I have come to report my top picks and your must-haves! I think the number one forgotten thing that I need to protect when I go to the beach is my lips!! I am an avid chap-stick user, so making the easier switch to one that uses an SPF was an easy choice. I was lucky enough to test out two different Lip Screens SuperGoop offers – each with very different uses and reasons why to use. If you are planning on going a week or so long trip to the beach where you will be spending some quality time soaking in the sun, I seriously suggest using the Shine On Lip Screen SPF 50. All you need is one coating and you are completely covered for up to 2 hours – plus my lips felt completely moisturized the entire time. Also, since the Shine On Lip Screen uses a brush to apply, you don’t even need to worry about the mess chap-sticks can make once they start melting in the sun! Brilliant! For a more everyday use, I would suggest testing out one of SuperGoops Fusion Lip Balm which has an SPF of 30+. Light, lux and amazing smelling – a perfect solution to protecting and nourishing your lips! My parents always used the Spray-on lotion, even on our faces… so I sort of adopted that habit. I did not even know I could have the option to be treating my skin while protecting it – thats where the Sun-Defying Sunscreen Oil comes in. With an SPF of 50 this oil diminishes signs of UV damage, prevents moisture loss, and enhances skin hydration – how amazing is that!!!! My skin felt so soft and hydrated while using this, even after hours on the beach! I never realized how much exposure my hands had to the sun. Whether it be driving in my car, sitting near a window or just walking outside – our hands are almost always exposed to the damaging rays. When I recieved SuperGoods Forever Young Hand Cream with SPF 40 I was PUMPED! I love hand-creams so I could not wait to give this one a go. By using an innovative blend of antioxidants and super broad spectrum protection with Sea Buckthorn Fruit, the lotion is formulated to help lighten dark spots while safeguarding skin from future damage. How awesome is that?! Not only did my hands feel softer, but they looked healthier after a couple uses!! If my picks aren’t suiting your sun-care fancy… check out SuperGoops entire line here! Happy shopping, XO.